The AFP Jul 9 quoted Merkel as having said, “To me, this dialogue is very important because 25 years ago, when the peaceful revolution took place in the former GDR, this finally led to the fall of the Berlin Wall and enabled us to have a free dialogue.” Merkel hailed from the GDR (German Democratic Republic), East Germany’s formal name under communist rule before the fall of the Berlin wall. She has said it was important for China too to have such a dialogue. 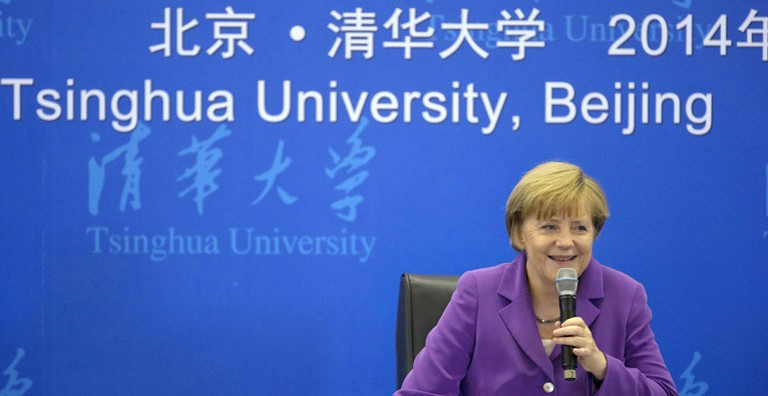 Merkel’s open call on China to respect human rights and engage in free dialogue was in marked contrast to the silence of many western leaders during their recent visits to China, the report noted. Nevertheless, official discussions dealing with human rights were expected to take place only behind closed doors. In 2007 China reacted with severe anger after Merkel met with Tibet’s exiled spiritual leader, the Dalai Lama. On Jul 7 the two countries signed a series of trade and investment deals, including agreements on two new Volkswagen factories and the sale of 123 Airbus helicopters, the report said.